If you’ve always wanted to add purple plantings to your Florida landscape, this is the fashionable year to do it! 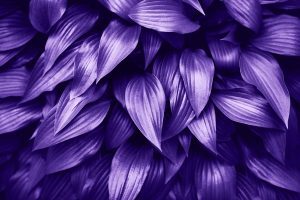 The Pantone Color Institute has announced “Ultra Violet” as its official 2018 color, and ArtisTree is tickled pink to offer you a purple punch list of pleasing options. For starters, there’s Mexican Petunia (Ruellia brittonia), a perky perennial that makes it a perfect choice. Some types are invasive, so you’ll want to plant this hardy fast-grower in large pots or in spaces edged by hardscapes. Ask your nursery if it has a sterile version of Ruellia and you’ll be rewarded with a big purple payoff. Then there’s the American Beautyberry that’s violet as violet can be. This deciduous Florida native shrub attracts birds and butterflies with long clusters of brilliant berries. As a bonus, you’ll be treated to lavender flowers in early spring and summer. Another purple-flowering plant for your Florida landscape is the gorgeous Dwarf Tibouchina, prized in Southwest Florida for its royal-purple blossoms. This evergreen shrub is happiest with a bit of shade and a bunch of top soil or organic peat humus poured into the hole before planting. Purple hues vary, but we promise you’ll find varieties that match Pantone’s Ultra Violet color perfectly. And don’t forget to consider hues to pair with your Ultra Violet plant choices, such as the Purple Prince Plant with evergreen leaves that are dark purple on top and purplish red on the bottom. In fact, purple pairs amazingly well with almost every imaginable color in Mother Nature’s world. We could go on and on — so many more plants in Pantone’s Ultra Violet shade such as pretty, prolific Pentas — but hopefully we’ve inspired your imagination enough to where you’ll visit a local nursery or call a professional landscape company to create a personalized design plan to fit your outdoor lifestyle. Live in Sarasota, Bradenton or Venice? Call ArtisTree Landscape Maintenance & Design at 941.488.8897 and we’ll pop over with plenty of purple picks for you.